Alright, everyone, are you ready for a product that will revolutionize the way you dry your clothes, especially in the summer? And cloth diapering mommas (like me!) - YOU ARE REALLY GOING TO LIKE THIS! Let me introduce and highly recommend the Best Drying Rack. If you like to dry your clothes or cloth diapers naturally in the summer sun, then you are going to love the way the Best Drying Rack dries quickly and easily! There is a reason they call this the Best Drying Rack. This strong and dependable clothes drying rack will save you money with a lifetime of reliable service. Never again will you have to fight with those flimsy and tippy accordion-type clothes drying racks sold at discount stores. Like a clothesline, the Best Drying Rack gives your laundry the freedom to hang without touching anything below it, so you get the full benefit of air drying your clothes. But it is great when you don't have a very big yard or a way to hang a clothes line! With 24 feet of clothes hanging capacity, stable tripod construction, and versatile hanging options our wooden clothes drying rack offers a practical and sustainable solution for your clothes drying needs. 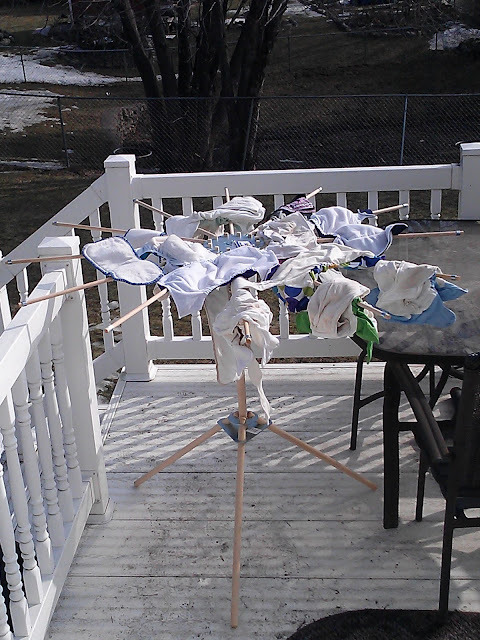 This is my BEFORE picture of how I was trying to dry my cloth diapers outside. 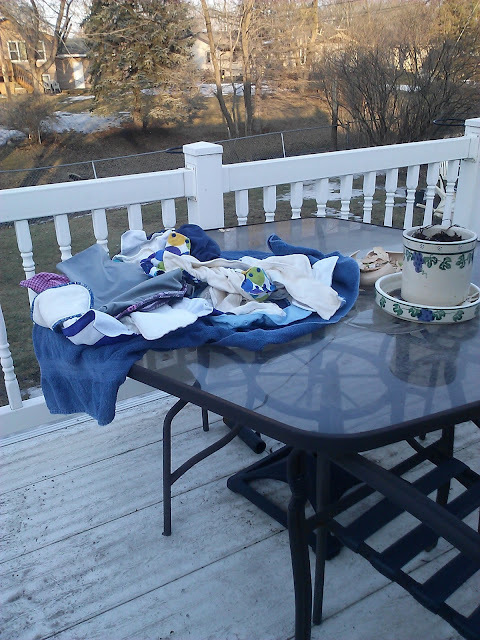 I have no clothes line or good way to dry them without getting them all dirty. The diapers dried VERY slowly and blew around. It was a pure disaster! This is my AFTER picture with the Best Drying Rack! Look at how organized my diapers are and how nicely they lay on the top of the Best Drying Rack. They get air and wind for drying on all sides and they can be laid nicely for bleaching from the sun! And the Best Drying Rack is SO EASY to set up and take down. It literally takes a few seconds! And then it folds up so small - it fits in any corner, under a bed, anywhere you want to put it!! Best of all, it is MADE IN THE USA and is made to be very durable and sturdy! It didn't blow around, break and it is made with steel pieces to ensure it lasts!!! I love that! So if you have been searching for a drying solution for cloth diapers, clothes that can't be dried in the dryer, or you just want an eco-friendly and energy saving alternative to your clothes dryer, you have to use the Best Drying Rack! It is really easy to use, set-up and take down, it is durable and it holds a lot of clothing/diapers. I am so excited for summer now and using this drying rack almost every day! For once, something really is AS EASY AS IT LOOKS!!! Buy It: You can purchase the Best Drying Rack for $79 from the Best Drying Rack website.